Desert activities are not done when the sun goes down. The bats come out of their cave at night to hunt and move from their daily slumber. The coyote howls alone as the moon shines above. The insects search for sweet fruit. The desert holds many secrets for those who listen to the song. 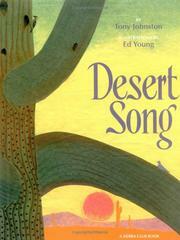 Johnston, Tony, “Desert song,” Children's Picture Book Database at Miami University, accessed April 18, 2019, https://dlp.lib.miamioh.edu/picturebook/items/show/6585.